I love a good suspense novel and when I read the premise of Think of a Number, I thought it had all the makings of a great novel. The storyline sounded so intriguing that I couldn’t wait to read it! Dave Gurney, a retired homicide detective, finds himself at a bit of a loss. While he’s been retired for just over a year, he has yet to figure out what to do with himself. He starts designing artwork based on photos of serial killers but, even then, he is at loose ends. Out of the blue, he receives a phone call from an old school acquaintance that he has not heard from in over 20 years. This gentleman has started receiving bizarre letters. The first one asks him to choose a number between 1 and 1000 and, when he does, he finds another envelope with the exact number he has chosen! The subsequent envelopes he receives contain bizarre poems. He calls on Gurney to help him because he is frightened and he does not understand what the person who is writing the letter wants from him. Gurney meets with him, tries to assist him and then learns the man is dead….. This murder marks the beginning of an ever-bizarre chain of events for Gurney, marked by riddles, murder and many twists and turns that leave as many questions as they do answers. The culmination of these events is one that is truly unpredictable! 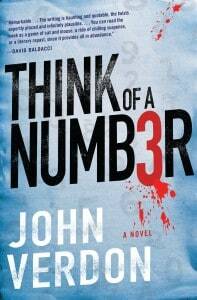 I thought the premise of Think of a Number was really interesting and I was excited to read this novel. I found, however, that once the initial premise was laid out, the book began to drag. The twists and turns in the novel don’t make a lot of sense and the premise, which begins with so much promise, becomes contrived. It seemed, at many points in the novel, that Verdon was stretching out the story when it could have been more tightly written to engage the reader and heighten interest. Instead, it simply detracts from the novel. I think Verdon has promise as a writer because his premise for this novel is unique. I believe, however, that he needs to work on his plot and character development to truly engage his reader. Think of a Number is a great idea in theory but it doesn’t translate well in practice.